A recent study from Website-Monitoring.com reveals that more than two-thirds of Google+ users are males. The company’s demographic breakdown of Google’s social users offered a lot of insights brands might find useful when deciding which platforms to focus on with social media marketing. In addition to Google’s reach among men (something of an anomaly in the social realm as Brafton has reported that women are generally more active on social sites), the network seems to offer access to younger, educated consumers. The report reveals that the majority of users list being a student as their occupation (more than 20 percent), and more than 42 percent are single. The second-most common occupation of Google+ users is in the technology field, with slightly more than 2 percent identifying as software engineers. The geographic reach of the platform is expansive, but the majority of users are based in the United States (31.49 percent). 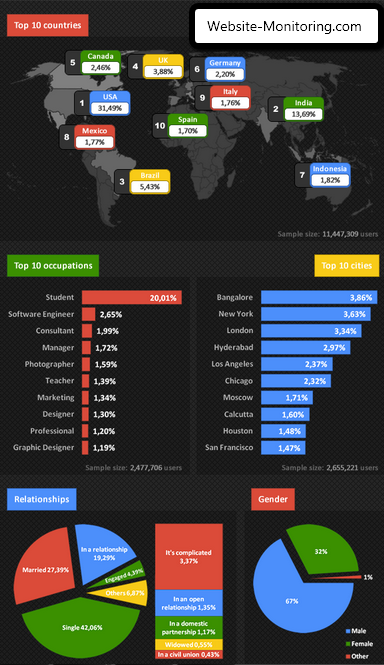 Nonetheless, Bangalore is the city where Google+ use is most common, representing 3.86 percent of all users. It is closely followed by New York City, which boasts 3.63 percent of all users. Los Angeles, Chicago, Houston and San Francisco are other U.S. locations that make the top 10 cities in terms of G+ users. This information might inspire marketers in some industries or locations to up the ante with Google+ as part of social media marketing to reach desirable audiences, but it will be interesting to see how the site’s demographic breakdown evolves as Google aggressively pushes all account holder to build their G+ presence. As Brafton has reported, the company claims to have more than 100 million users at present and it is requiring all new Google users to set up their Google+ profiles when they create an email, YouTube or other Google account.